They have a unique genetic composition that makes them different from the “conventional” cattle breed. Every animal in the herd are DNA tested for the myostatin gene. Piedmontese cattle have an inactive myostatin gene, which gives them double muscle, restricting the number of fibers within them. While the beef has, visually, less marbling, because of its rare genetics, the familiar tender and juicy flavor is still present but with less fat, lower calories, and makes a for healthy protein option. The quality of Certified Piedmontese beef is in the science. A study, conducted at the University of Nebraska-Lincoln, showed that the beef was more tender than other cuts of meat, matching up to high-end meats like Wagyu or Prime. Per the USDA Nutrient Database Release 24, it also proved that Piedmontese beef has fewer calories than roasted chicken breast as well as other meats. Need more numbers? 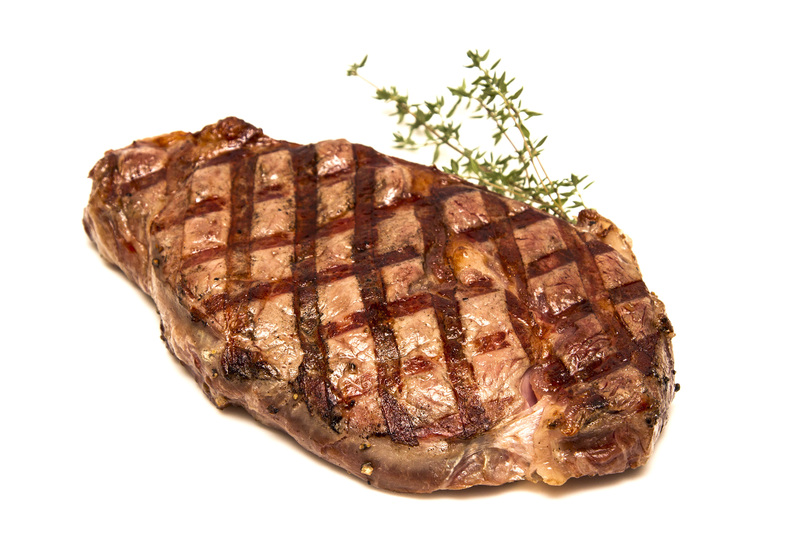 A 4-ounce USDA Prime-grade ribeye contains 30 grams of fat while a 4-ounce Piedmontese ribeye only contains 10 grams. In the U.S., Piedmontese cattle are raised humanely in the Great Plains. The cattle roam and graze freely, eat an all-natural and nutritious (vegetarian) diet, drink fresh water, and live a comfortable life that is drastically different than how other breeds of cattle are traditionally raised. They are never given any antibiotics, hormones, steroids, or animal by-products. Every one of their animals is tracked through an advanced tracking system that keeps record of their overall history – gender, growth, health, nutrition, and more. Transparency is an important and growing trend these days – people want to where their food comes from. This tracking system not only allows for people to find out about Piedmontese Cattle but also allows the ranchers to manage and improve the health of the animals they raise. Ranchers uphold an equally strict standard when it comes to the relationship with the environment and the raising of Piedmontese cattle. High importance is placed when using the Ogallala Aquifer, an underground resource of water. They make sure that their usage does not affect its sustainability. If you’re looking for red meat that is low in fat, high in protein, and full of delicious flavor, then Certified Piedmontese beef is the meat for you! To learn even more about Piedmontese beef, visit www.piedmontese.com. Try it today! Pick up Piedmontese Beef from our Meat Department at your local Mollie Stone’s Markets store! Be sure to share your favorite way to enjoy steak in the comments box below! Don’t forget to share your photos with us by posting onto our Facebook page or using the hashtag #CookingWithMollies on Instagram or Twitter.